Dressing for your climate gets literal with Diffus’s Climate Dress, which the Danish design company has laced with hundreds of tiny LEDs that respond to carbon dioxide in the atmosphere. Powered by an Arduino Lilypad microprocessor and a carbon dioxide detector, the haute-tech frock uses conductive embroidery to transmit information to the hand-stitched lights, resulting in patterns that range from slow pulses to rapid flashes depending on the concentration of the greenhouse gas. The Climate Dress, which made its public appearance at the Bright Green Expo in Copenhagen, brought together diverse talents, including fashion designer Tine M. Jensen, the Danish Design School, the Alexandra Institute, and the embroiderers at Forster Rohner. The light patterns vary from slow pulses to rapid flashes depending on the CO2 in the air. Dressing for your climate gets literal with Diffus's Climate Dress, which the Danish design company has laced with hundreds of tiny LEDs that respond to carbon dioxide in the atmosphere. 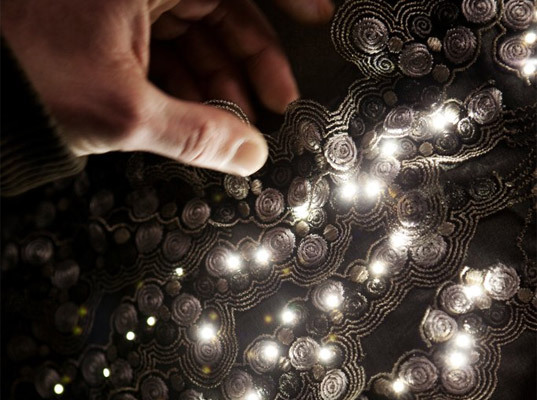 Powered by an Arduino Lilypad microprocessor and a carbon dioxide detector, the haute-tech frock uses conductive embroidery to transmit information to the hand-stitched lights, resulting in patterns that range from slow pulses to rapid flashes depending on the concentration of the greenhouse gas.